Another facial oil has captured my heart. 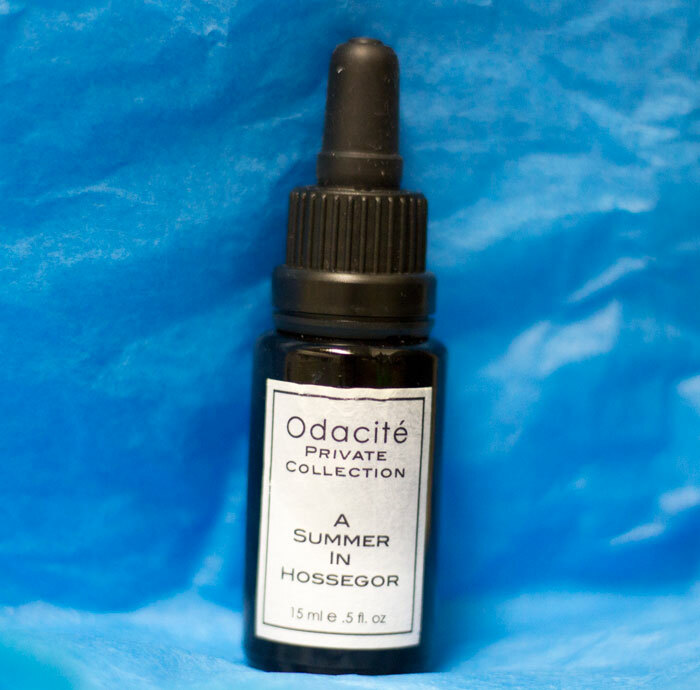 Tucked away in the Odacite Private Collection is the absolutely gorgeous facial oil “A Summer in Hossegor,” named for the founder’s south west of France family home. While I’ve never been to the south west of France (or Europe in general — can we please fix this? ), I’m getting a bit closer every time I use this skin booster, made with wild carrot seed oil cold-pressed in a small French village. Designed to fade brown spots, Odacite’s “A Summer in Hossegor” is packed with just four simple-yet-effective natural ingredients that offer a potent combination of vitamins A, C and E.
Organic wild carrot seed oil, organic wildcrafted blueberry seed oil, organic papaya seed oil, organic buruti oil. Wild carrot seed oil, the first ingredient on the list, is one of those oils that is so underrated. It has an amazing rejuvenating effect on the skin thanks to powerhouse antioxidants. What really takes the cake in this oil, though, is the organic, wildcrafted blueberry seed oil. “A Summer in Hossegor” smells like fresh blueberries, and what better free radical-fighting ingredient can you find than nature’s own antioxidant-packed blueberry? This is another ingredient that I haven’t seen in too many other skincare products — especially not as ingredient No. 2! The addition of organic papaya seed oil in “A Summer in Hossegor” really stole my heart. My mother, who hails from Vietnam, has told me stories of how her mother used the ultimate natural beauty products — fruits and veggies — to take care of her skin. Papaya was one of the main fruits my grandmother used to keep her skin beautiful, and most women of Asian descent (myself included!) struggle to keep brown spots and hyperpigmentation at bay. Papaya seed oil is rich in papain, which prevents and helps eliminate brown spots. Odacite is onto something here (and grandma is always right!). The final ingredient in this well-edited oil is buriti, which comes from Amazonian palm trees. Buriti oil offers hydration but is also high in vitamin C and beta-carotene, giving it high antioxidant and sun-protection properties. I can’t rave more about this. The ingredients list is short and sweet, yet packed with effective and unique ingredients. The $149 price tag is shocking, but it’s not the first time I’ve mentioned an expensive oil that I love. My rant on this oil? The paper label. I’ve mentioned this before, too, but I just hate when my grubby, product-and-water-ridden hands muck up delicate paper labels. You may or may not be able to tell in my photo above, but this is just a minor detail. I applaud the use of a dark bottle, though, to protect what’s important — the precious ingredients inside! So, bottom line, would I buy this oil? Not immediately, because I’m over my eyeballs in oils, but as I continue to edit my collection (giving away items that aren’t “top shelf” material to friends and family), I’d definitely give “A Summer in Hossegor” heavy consideration. I wonder if Grandma, the papaya skincare queen, would approve. Have you tried anything from Odacite? What are your thoughts on carrot seed, blueberry, papaya and buriti oils? How much is too much for a small bottle of facial oil? Tell me in the comments section!